Learn how to paint like Eric Carle, using wax paper, acrylic paint, and a fun scraping technique. We’ve been making lots of Easter egg crafts this week in my home daycare. 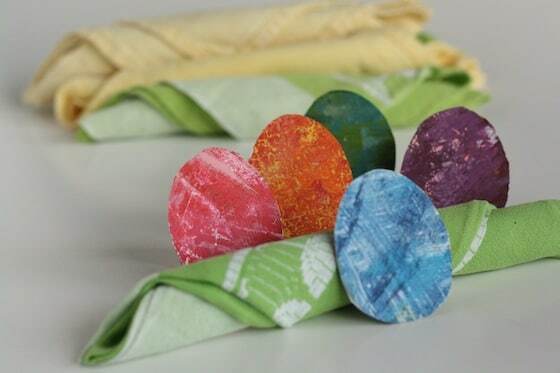 These homemade Easter Egg napkin rings are a terrific Easter craft for kids to make. 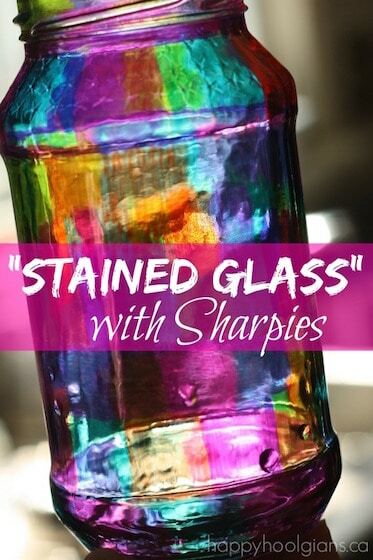 Not only are they colourful and pretty, the paint technique is so cool! Inspired by the great Eric Carle, we’ve scraped and blended our colours together to using a fun painting process that kids of all ages will enjoy. Have you ever looked at a piece of Eric Carle art, and wondered how he makes his artwork look the way it does? Don’t you just love it? It’s so cheery and bright. It has depth and dimension, and it’s so unique. 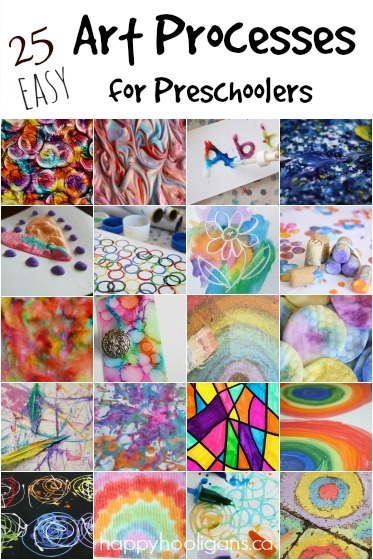 Well, recently, I watched this slideshow by Eric Carle, and I was delighted to learn see how he applies layers of paint to a sheet of tissue paper to achieve that beautiful effect that we know and love so well. I was surprised by how easy the process looked, and was curious to try painting “Eric Carle style” myself. Guess what. It was totally fun! 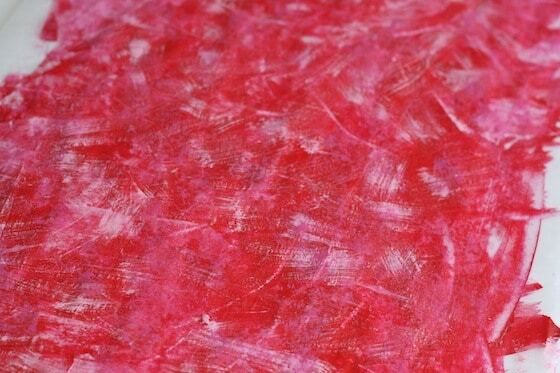 I got right into it, and ended up creating several different sheets of paper in all different colours. They were just beautiful, and I knew we’d be able to craft with them. 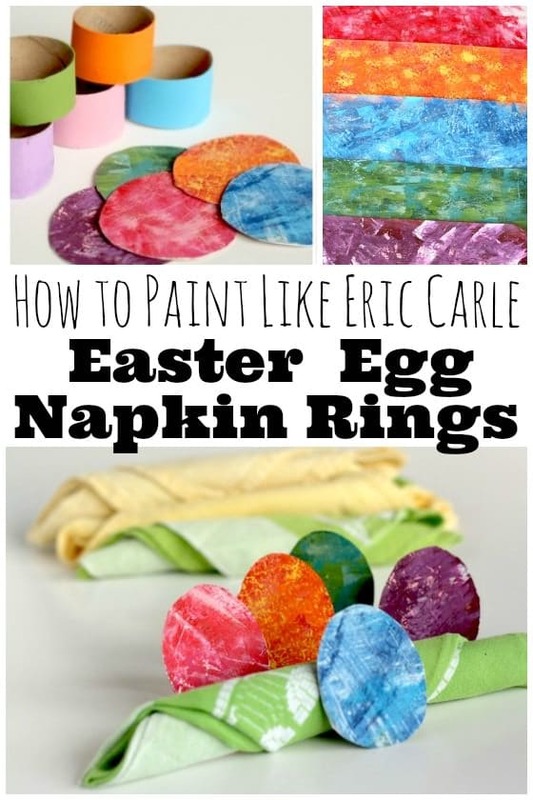 I’m going to show you how to make some coloured sheets of your own, and how your kids can use them to make Easter Napkin rings for your Easter dinner table this year. Instead of using tissue paper like Mr. Carle does, I used wax paper. For my painting tools, I used brushes, sponges, an expired credit card, and plastic vegetable netting. I used acrylic craft paint for this project. For each coloured sheet, I used several shades of paint belonging to the same colour family. 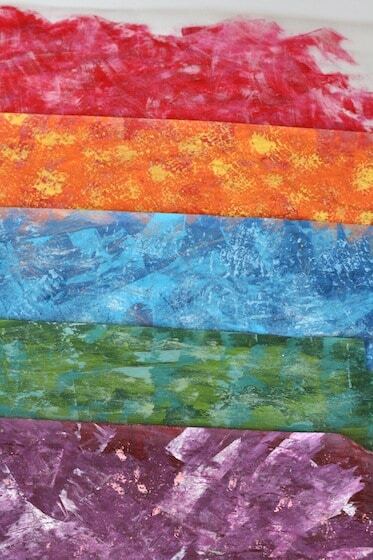 I simply layered the colours on, scraping, sponging and blending as I added each colour. You could use contrasting colours like Mr. Carle does in the slideshow if you don’t want to stay within the same family of colours for your papers. I was so excited with the way they turned out, and how much they really look like the pictures in Eric Carle’s books! At first, I wasn’t really sure what to make with them, so I left them all sitting on the dining room table, hoping for some inspiration. After a couple of days, it came to me: Easter napkin rings! They’d look great along side our homemade Easter egg table toppers. For the napkin rings, I simply cut a paper towels rolls into small rings, and painted those with acrylics in Easter colours. 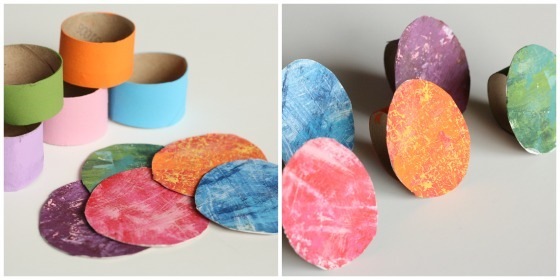 Then I cut “Easter eggs” out of my painted paper sheets. 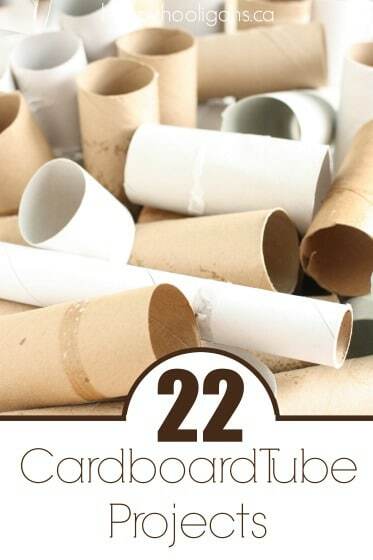 I glued those onto some white cardboard to make them sturdier, and I cut those out. 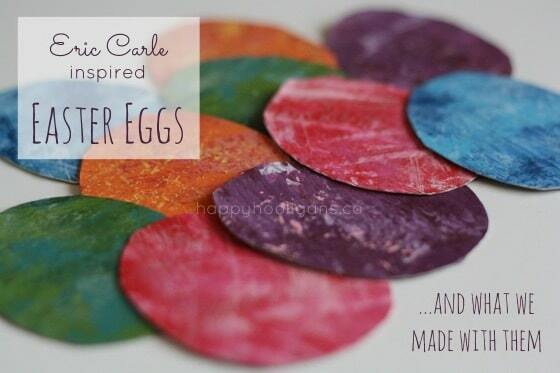 To finish, I glued my Eric Carle Easter eggs eggs to the paper towel rings. Won’t these napkin rings look cute on your Easter dinner table this year? Want to know what else would look fab on your Easter table? These adorable Easter Chick place-holders by Crafts By Amanda! Are they not the sweetest, little things you’ve ever seen? Again, I love this craft! I just wish I had time to make these, but my house is torn apart for new flooring we just had installed and a lot of my crafts are packed up! Oh well, maybe another time! Great job, Hooligans! Happy Easter!! 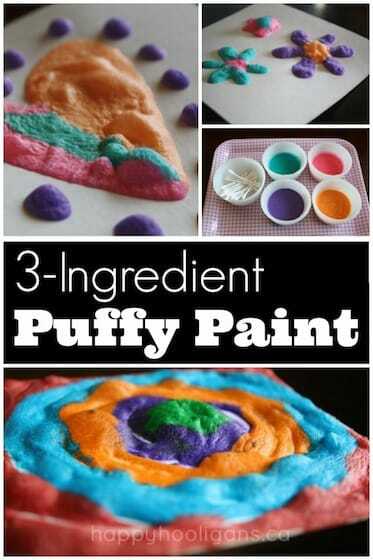 These are really sweet- perfect for Easter supper! Pinning. Thank you so much for letting me know, Margot! What an honour! These are very beautiful napkin rings. Thanks for sharing! 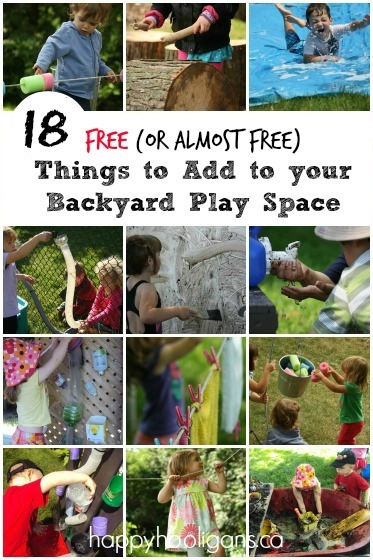 This is such a cool idea!! I’m a huge fan of Eric Carle and his work. Have done many crafts and parties based on his books. These will look beautiful on any Easter table.